Wood, bricks, blocks, concrete – AAP Construction has built retaining walls from all these materials in Clifton, New Jersey and we'll be pleased to build a retaining wall for your property in your choice of materials. A Clifton retaining wall can separate an elevated patio from the rest of your property, enclose a raised flower bed, or protect a vegetable garden – we've done them all since 1993. Your Clifton retaining wall may be a purely functional one built of concrete. Or you can have a purely ornamental one built from multi-hued stones. Call us at (973) 298-1013 and we'll spoil you with choices – and give you attractive prices with no sales pressure! No matter what the needs of any resident of Clifton, NJ, we have him or her covered. We'll build a standard gravity wall, a cantilevered wall when extra buttressing is needed, and, where the soil pressure is extreme, an anchor wall which has bulbous, concrete subsoil 'anchors'. 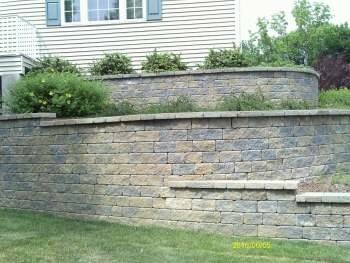 Let us do your Clifton retaining wall job, big or small – call us now at (973) 298-1013 for a no-obligation visit and a free quote!